This is our blog - keep checking for updates! 13th April - Busy morning digging the test holes for the foundations. Many thanks to Bob Matthews and his team from RMC for offering their services (and digger). And, of course, to Cllr Sean Driscoll for fetching the coffees!! 10th April - Hywel John from Hywel John Surveys Ltd came to do a 3D laser scan of the building and courtyard. What a clever piece of kit - can’t wait to see the results. 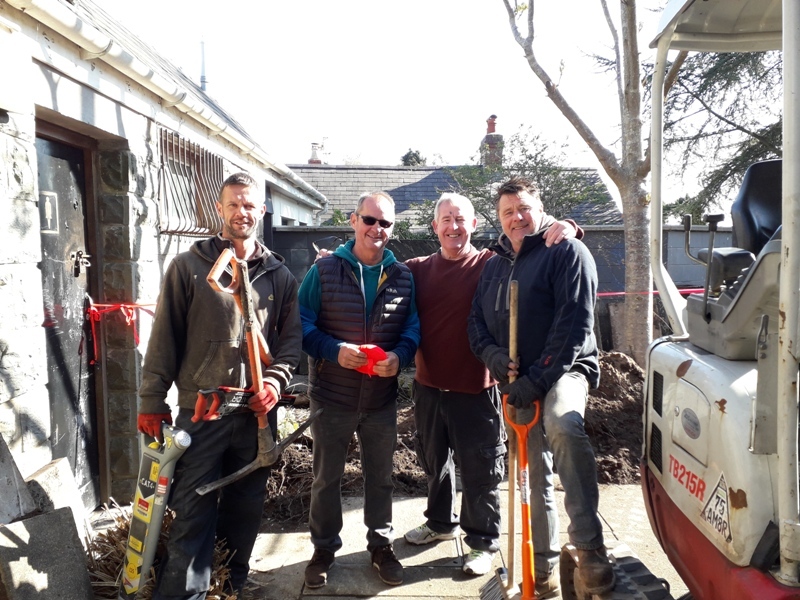 14th March - Coffee at Jaspers with our Cllr Sean Driscoll to get things moving on the test holes for the foundations and archaeology. 13th March - Meeting with Karl from Sonic Alarms to work out how to make The Pound, and our volunteers, as safe as possible. Oh, and to safeguard the Bishop’s Castle, too. 5th March - Meeting with Bryn from GB-Sol about the possibility of using solar slates on our roof - both eco-friendly and will look good in a conservation area, next to a medieval Castle! Followed by first meeting of our Buildings Advisory Group. 19th February - Our community event attracted 80 supporters keen to see the plans for The Pound and gave us the opportunity to announce being offered £10,000 from the Waterloo Foundation. 7th February - We’ve achieved a £5,000 development grant from the National Lottery Community Fund to go through Planning and let us research being eco-friendly in The Pound, eg solar panels, water-harvesting (for all those flushes of the loo!) And bat boxes, of course! And we’ve had a great meeting with BYB Accountants in Llandaff about VAT. 1st February - Announcement that we have been successful with our Welsh Government grant for £200,000 and Cardiff YMCA (1910) Trust grant for £3,000. After two years work, we can begin! 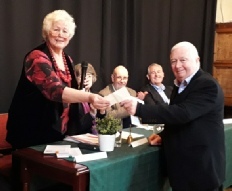 Yvonne Apsitis (Chair, Llandaff 50+) receives a cheque for £3,000 from Roger Coombs (Chair, Cardiff YMCA (1910) Trust) at the Moving Forward Celebration event. Seated are: Baroness Finlay of Llandaff (Patron); Matthew Williams (Patron) and Cllr Sean Driscoll. 13th January 2019 - Rebecca from East Ecology visited The Pound - are there bats in the roof?